NIA CHARLESTOWN NEVIS (June 30, 2016) — Deputy Premier and Minister of Tourism Hon. 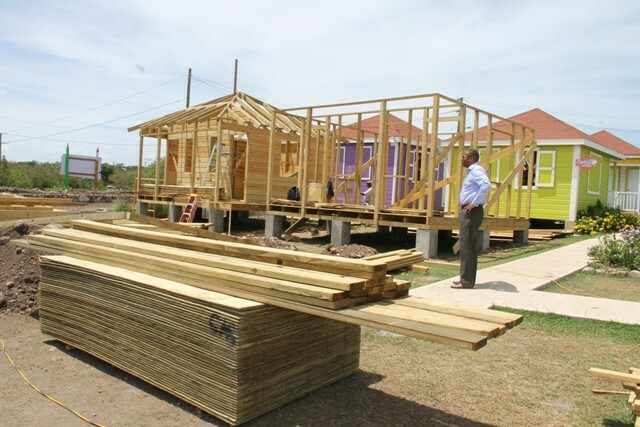 Mark Brantley registered satisfaction with the progress of ongoing work by the Ministry of Tourism on Nevis to enhance key tourism attractions on the island. 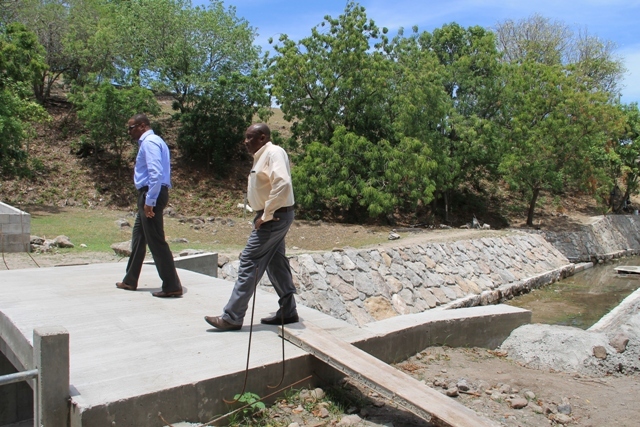 Mr. Brantley was accompanied by Permanent Secretary in the Ministry of Tourism Carl Williams, when he toured the Bath Stream, the Nevisian Heritage Village at Fothergills, the New River Open Air Museum and the Artisan Village at Pinney’s Industrial Site on June 28, 2016. He noted that the ministry is systematically trying to develop, over time, the various resources and sites which fall within its purview. The Tourism Minister thanked staff at the Ministry for their efforts and those contracted to conduct the work at the various sites. Meantime, Mr. Williams told the Department of Information that the projects are being undertaken to enhance the island’s tourism stock because it is responsible for product development. “We realise that if we are to attract more visitors, we have to upgrade the attractions so when they come they will have rewarding experiences. So we have embarked on those projects,” he said. 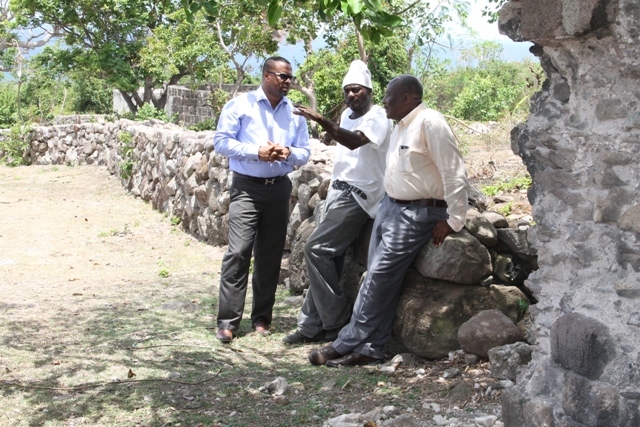 However, he explained that although the ministry was upgrading the Artisan Village, it is not a heritage site. “It’s basically a commercial venture where our artisans and craft men and women are able to prepare and sell their products. In the past most operated from their homes or on the side of the roads. “We wanted to give them a central location to showcase their skills and their products,” he said. Regarding the ongoing work at Bath Stream, Mr. Williams noted in the long term, the entire stream will be cleaned and cleared. He indicated that clearing work had already commenced in some areas beyond the Bath Bridge leading to the sea which would allow the stream to flow freely, eliminating areas of stagnation. Some work will be done to guard against further erosion in other areas along the stream. The tourism official stressed that every care would be taken to prevent the destruction of the nesting sites of the cattle egret and other birds nesting along the stream. He said persons interested in bird watching would have a better view of the birds in their natural habitat. Mr. Williams also spoke of the ongoing work at New River. “We are doing some stone work and we have cleared a plot of land. Sometime soon we will get it ploughed to plant some sugarcane to compliment what is happening here. “Eventually persons can come and get some cane juice and other sugarcane products like sugar cake, tarts, etc. That’s what we would like to see in the long run. So hopefully by next season a lot of these things will be put in place,” he said. 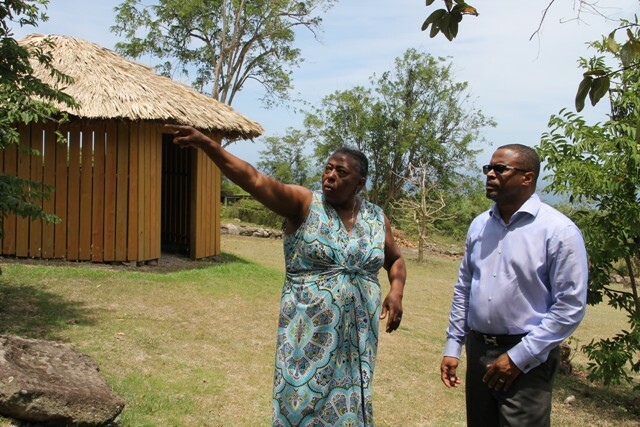 Meantime, during the tour of the Nevisian Heritage Village, Supervisor Patricia Thompson spoke of the most recent developments there including the re-roofing and construction of new huts done with local labour.